The Kieler Woche 2019 offers a lot of opportunities for bands of all genres and levels. Booking agencies and live acts can now apply here! Kieler Woche is the biggest sailing event in the world and at the same time the largest summer festival in Northern Europe. More than 280 pop, rock and classical concerts will take place on stages all over the city and provide great entertainment for ten days. 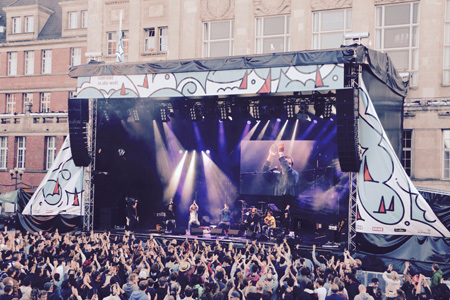 One of the main stages at Kieler Woche is the Rathausbühne (City Hall Stage) with a large LED screen. The Pirate World Stage is located right next to the Rathausplatz, while the Woderkant Festival takes place in the vicinity of the Kiel Fjord at “Kiellinie”, the famous seafront promenade. For local acts from Schleswig-Holstein, the Junge Bühne (young stage) in the Ratsdienergarten is the ideal venue. Wanted: Bands, singer/songwriters, solo acts, tribute and cover bands and many more. Whether you are a booker in an agency or a musician in a band: apply in just a few steps. Backstage PRO does not charge any fees for this. Please note: Agencies can submit applications for multiple bands and different slots. Be there and apply for the “Kieler Woche” gigs in the northernmost capital of Germany. Good luck!